Tienes preguntas sobre asuntos o estatus de migración? Estas enfrentando o conoces a alguien que esta enfrentando deportación? Ven a hablar con un abogado en nuestra clínica legal gratis sobre migracion. Do you have legal questions about immigration status? Are you or someone you know facing deportation? 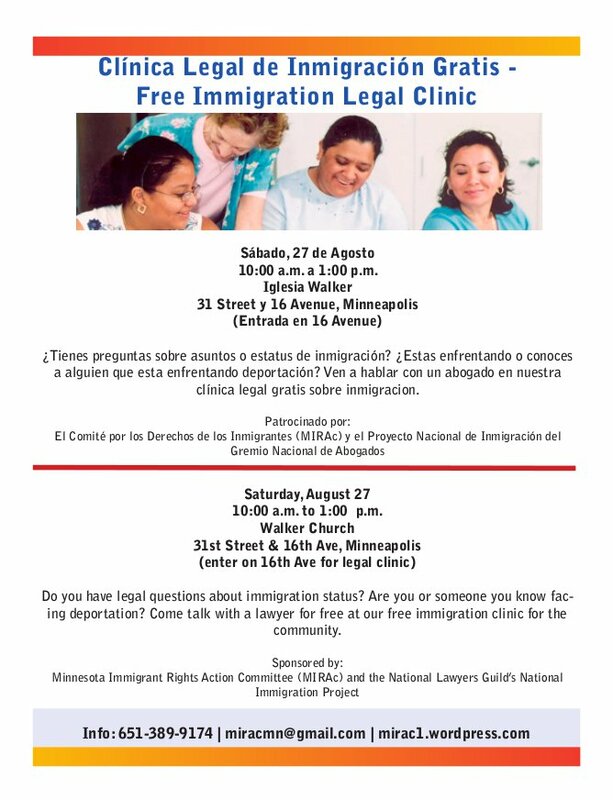 Come talk with a lawyer for free at our free immigration clinic for the community. Update 8/17: Boycott Arizona-Minnesota just released a video based on a right-wing sports talk radio interview with MIRAc/BAM! member Molly Glasgow. Glasgow was one of the five people arrested for civil disobedience. Working with allies Centro Campesino, SEIU Local 26, Presente and MoveTheGame.org, MIRAc and the BAM! campaign organized a protest and civil disobedience at the quarterly meeting of MLB team owners helped to once more bring the problems generated by Arizona’s new racist law, SB1070, before the eyes and conscience of the nation. MIRAc and U of M SDS members arrested trying to deliver petitions to MLB Commissioner Selig. The nonviolent civil disobedience by the protesters trying to deliver the petitions to Bud Selig and the owners captured the attention of national media. Martiga Lohn’s coverage for the Associated Press was picked up by ESPN and posted as Five arrested in All-Star protest. 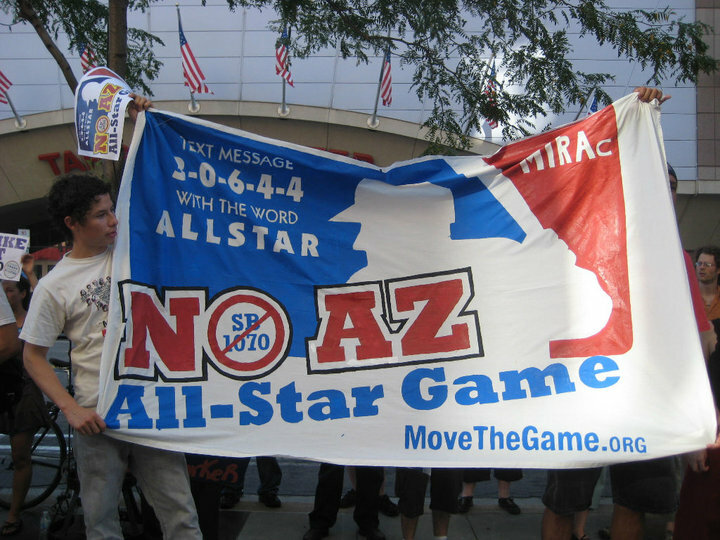 The NBC Sports Hardball Talk blog posted commentatory in 2011 All-Star Game protesters arrested. The action grabbed the headline at USA Today’s MLB-related site in the post Five arrested in All-Star protest outside MLB’s quarterly owners’ meetings – Daily Pitch: MLB News. Locally, WCCO posted the AP story as 5 Arrested In All-Star Protest At Baseball Meeting. Roa, 22, said immigration rights groups are continuing their campaign to move the All-Star Game from Phoenix even though a federal judge last week struck down portions of the Arizona law. He wants it to be completely revoked. Opponents of the law attempted to present Selig with these same petitions in Anaheim last month during the 2010 All-Star Game, but they couldn’t gain access to Selig. 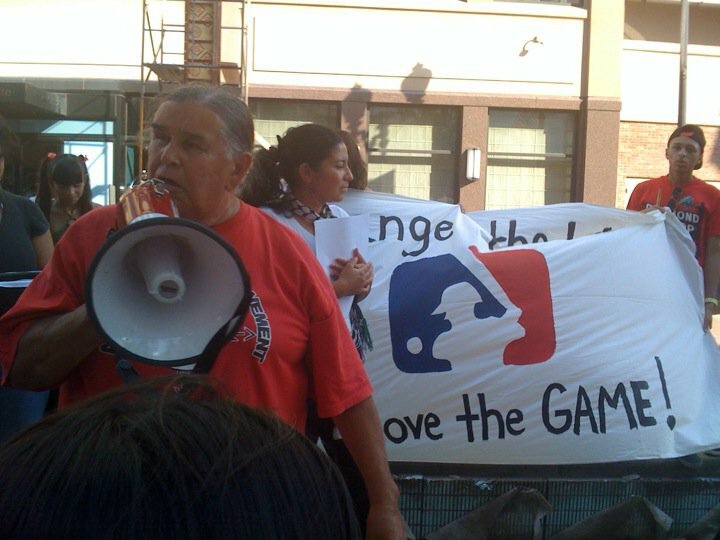 Protesters have also appeared outside of Selig’s Milwaukee offices. . . .
Clyde Bellecourt (American Indian Movement) speaks at the Move the Game rally. MINNEAPOLIS – About 100 people demonstrated outside the Graves Hotel, where Major League Baseball owners are holding their quarterly meetings. The protesters say Major League Baseball should move next year’s all-star game from Arizona because of that state’s new immigration law. “Immigrants and Latinos, who are a large part of the players and the fans, are offended by this law and we hope they will they will do the right thing and move the game,” said Nick Espinosa. 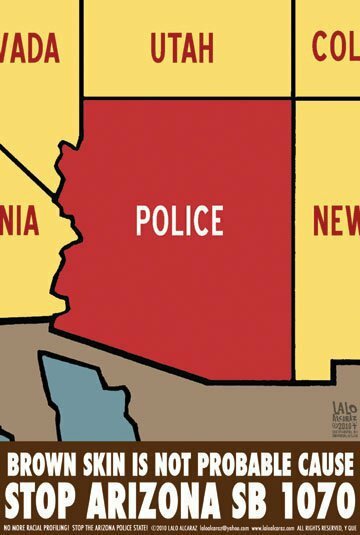 Critics argue the law which makes it illegal to be in Arizona without documentation encourages racial profiling. Supporters say it’s needed to crack down on the rising crime committed by the ever growing number illegal aliens. . . .FBI statistics show violent crime rates in all of the border states are lower than they were a decade ago . . .
Protest against MLB owners meeting in Minneapolis. Major League Baseball Commissioner Bud Selig was in Minneapolis Wednesday for a quarterly meeting and to celebrate the completion of Target Field. But, the cheers outside his meeting were anything but positive. Hundreds protested outside that meeting at the Graves Hotel Wednesday afternoon. The group wants next year’s All-Star game moved because it will be in Arizona and they’re against the new immigration law. They say an event that could pump $60 million into Arizona’s economy belongs elsewhere. The group tried to deliver 110,000 petitions to Selig. When police asked them to leave they refused and five people were arrested.
. . . Niger Arevalo of the Minnesota Immigrant Rights Action Committee said the MLB shouldn’t support Arizona’s law. Media Ghost TV posted two extended video features about the protest and civil disobedience on its website: Part 1 and Part 2. Chanting “Stop the Hate! Move the game!” protesters crashed a quarterly meeting of Major-League Baseball owners at the Graves Hotel yesterday, demanding that the All-Star game be moved from Arizona unless the state repeals its controversial new immigration law. “We want to send a clear message to the owners of the league, that here in Minnesota we support moving the All-Star game somewhere else,” said Niger Aravalo of the Minnesota Immigrant Rights Action Committee. Aravalo also called on Hispanic MLB players to urge their coaches and team-owners to get the game moved. . . .
Fight Back News reported Protesters confront baseball bigwigs, 5 arrested while Twin Cities Indymedia posted Baseball Fans Demand: Move the Game! 5 Arrested Delivering 110,000 Petitions to MLB Owners. What will be the next breaking news in the Move the Game story? Monday June 14, 5:30PM @ Jimmy John’s Minneapolis 600 Hennepin Ave. South Block E, on 6th St.
Jimmy John’s has consistently funded the campaigns of anti-immigrant demagogues like Joe Arpaio and John McCain who are outspoken supporters of SB1070. For this reason we are giving Jimmy John’s the title of: “Arizona’s Favorite Sandwich”. 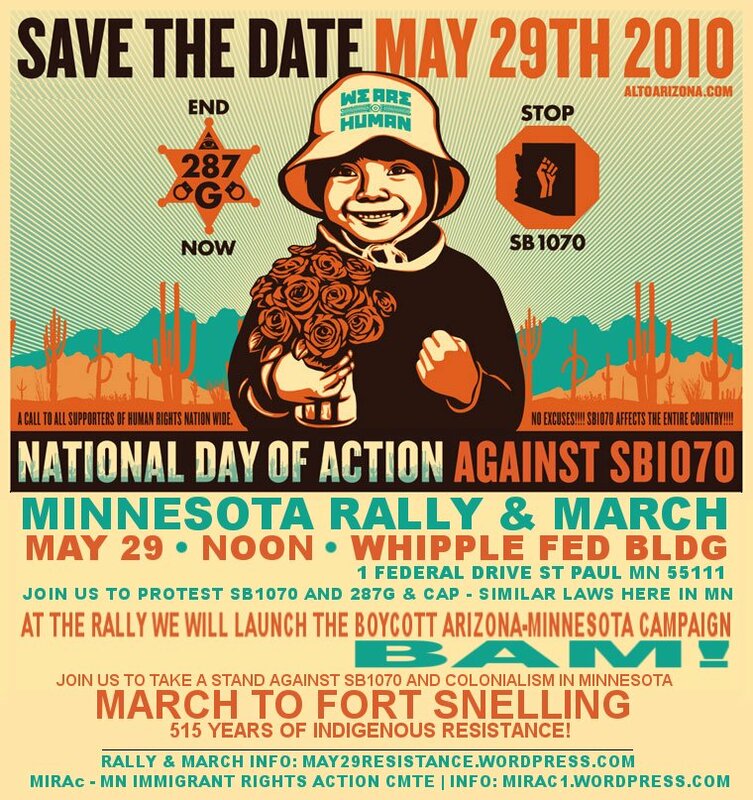 We will demand that they publicly denounce SB1070 in writing–or face the boycott! Protest Anti-Immigrant Policians and Laws: Protest Tom Emmer! Tom Emmer, the Republican candidate for governor who called the hateful Arizona law SB1070 “A wonderful first step” will be the keynote speaker at a GOP fundraiser. We will make sure he knows that Minnesota is not Arizona and that we will not stand for those kind of racist laws in our communities! Join us for an action for immigration reform at Baja Sol. Tony Sutton, the owner of Baja Sol, is also the chairman of the MN GOP – making money selling Mexican food with one hand and attacking immigrant families with the other. To find out how you can get involved come to our planing meeting! Join us to discuss ideas and actions for this summer’s campaign to stop racist Arizona laws in Minnesota. Come to brainstorm, share ideas, and find out how you can get involved in the struggle against hateful anti-immigrant measures in Minnesota, and stop the criminalization of our communities! Day of Art – We will be making signs and banners for next week’s protests right after our BAM! Saturday meeting at El Colegio Charter School. Unete y discutir ideas y acciones para la campaña de este verano para parar leyes racistas como la ley SB1070 de Arizona en Minnesota. Ven a compartir ideas y escuchar como usted pueda involucrarse en la lucha en contra de programas anti-inmigrantes de odio en Minnesota, y poner fin a la criminalización de nuestras comunidades. On May 1st, over 6,000 immigrants and allies marched against the racist Arizona law SB1070 and for a just immigration reform. We would like to extend a HUGE thank you to everyone who joined us, and helped make the event such a success! Unfortunately, it seems not everyone got the message. Just a few days later Republicans introduced a copycat bill in Minnesota; just like Arizona’s, it would turn racial profiling into law. The time has come for the next step. An alliance of Minnesota immigrants and their allies are launching a campaign to show the right wing extremists that we will not tolerate hateful Arizona style laws in Minnesota. 1. Help to Repeal SB1070 in Arizona by encouraging individuals, organizations, and businesses to boycott Arizona. 2. Stop the copycat bill in Minnesota and fight existing programs already tearing our families apart, terrorizing anyone who looks “suspicious”. 3. Push for a real solution to this broken system – federal immigration reform with legalization and full equality. May 29th is the national day of action against SB1070 and immigrants rights advocates around the country will be taking to the streets to demand an end to hateful policies that criminalize our communities. In solidarity with Arizona, and the Minnesota immigrant community threatened by similar laws here; we will be kicking off the BAM! campaign. Afterwards we will march to nearby Fort Snelling to unite with our indigenous Dakota brothers and sisters in solidarity with their demand to take down the fort and 515 years of resistance to colonization. See you on May 29th! 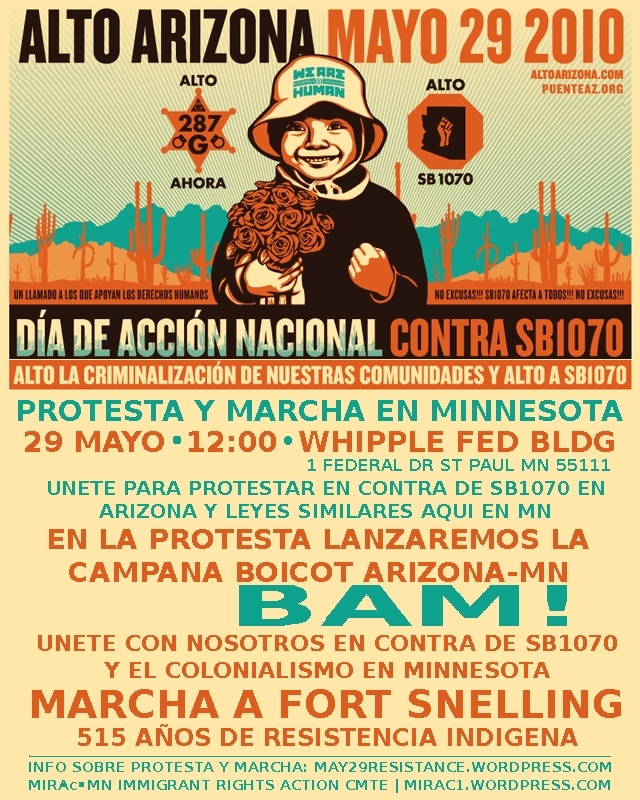 Este 1ro de mayo más de 6,000 inmigrantes y aliados marcharon en Minneapolis contra la ley racista de Arizona SB1070 y para una reforma migratoria justa. Queremos extender un INMENSO gracias a tod@s l@s que se unieron y ayudaron a hacer de la marcha un gran éxito. Desafortunadamente parece que no todos recibieron el mensaje ya que justo unos días después los republicanos en Minnesota introdujeron una ley casi idéntica a la ley de Arizona que convierte a la discriminación en ley. Una alianza de inmigrantes y aliados de Minnesota están lanzando una campaña para demostrar que nosotros no toleraremos leyes al estilo de Arizona aquí en Minnesota. 3. Empujar para una solución real a este sistema roto–reforma migratoria a nivel federal con legalización e igualdad total. El 29 de mayo es el día nacional de acción contra la ley SB1070 y los aliados de los derechos de inmigrantes alrededor del país tomarán las calles para demandar un fin a políticas odiosas que criminalice nuestras comunidades. Lanzaremos nuestra campaña BAM! en una protesta afuera del edificio federal Whippler. Después marcharemos al Fort Snelling para unirnos con nuestros hermanos y hermanas indígenas y Dakota en solidaridad con 515 años de resistencia a la colonización. ¡Nos vemos el 29 de Mayo! We have decided to change the march route and end point for tomorrow, to march to the Republican State Convention at the convention center downtown, before ending in Loring Park for a united rally. We hope you will join us for the May 1 march for immigrant and workers rights tomorrow starting at 2:00 pm at Martin Luther King Park, 41st and Nicollet Ave S.
Wednesday both Republican contenders for governor, Tom Emmer and Marty Seifert, announced their support for the new racist Arizona law, SB 1070. We will send them a strong message: Minnesota is not Arizona! We need a just reform with legalization and equal rights for all! Marches leaving from 3 starting points are expected to number in the thousands, and will converge as one in downtown Minneapolis on Saturday. The marches will meet outside the Republican State Convention at the convention center downtown for a brief stop, before marching united to Loring Park. Join our coalition of more than 40 groups to demand real legalization for all, workers rights, driver’s licenses, and equal rights for all, and an end to immigration raids, deportations, and discrimination! EMERGENCY VIGIL/PROTEST AGAINST RACIST ARIZONA LAW SB1070! A coalition of community organizations is holding an emergency vigil and protest after Arizona Governor Jan Brewer signed into law the most extreme anti-immigrant legislation in the country (SB-1070) on Friday. This disgusting bill legalizes racial profiling, and mandates local law enforcement to check proof of citizenship of anyone they encounter. We will gather to protest a fundraising event for local religious right outfit the Minnesota Family Council attended by national level republican politicians Mike Huckabee and Governor Tim Pawlenty, who have a long track record of anti immigrant sentiment, to send a strong message to the politicians of Minnesota, and the United States. • NO to SB1070 and racist laws! • Boycott Arizona until SB1070 is repealed! • END racist anti-immigrant policies that unfairly target immigrant workers and families, including 287G! • Just immigration reform that includes legalization and equal rights for all immigrants NOW!